You knew it the second that you met…..There was just something special about the two of you together that was a story unlike the world had ever heard before. Now you are lucky enough to need a reception just as extraordinary as your love. From the best Sydney wedding band and Melbourne wedding band around to larger-than-life reception entries, here are 6 wedding entertainment ideas that will make your reception unique. If sliding was good enough for the Goo Goo Dolls, it’s good enough for you and your wedding reception. A super slide is a fun and festive way to not only enter your reception… but also provide a little unexpected entertainment for your guests. Plus, your friends will be talking about it for years to come. Put simply, this entertainment idea is Instagram gold. An old-school ice-cream truck is a great way to bring a little hipster-chic to your wedding reception. 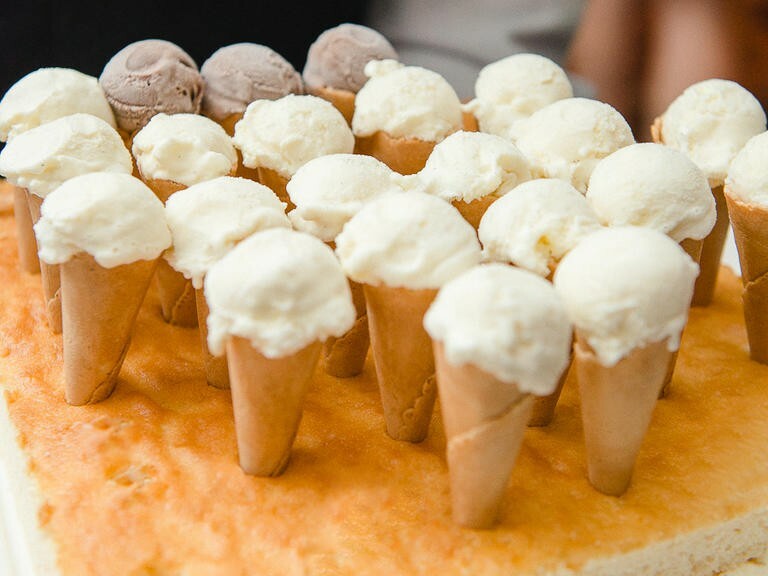 Not only are ice-cream trucks a creative addition to a vintage-inspired wedding, but they also make you feel like a kid again. On such a grownup day… this is definitely a good thing for your pre-wedding “I don’t wanna grow up” jitters. Or whatever color you want to go with. Create a balloon-popping zone where you take paint-filled balloons, tape them to a canvas and then have guests throw darts at them. The end result? A unique painting that you can take home and hang in the entryway of your house to remember your special day. And… if it turns out ugly… you can always put it in the basement with the other eyesores you can’t bear to part with. Who doesn’t love a good ole bouncy house? Rent out a bouncy castle to complete your fairytale wedding. Not only is it fun, it won’t completely compete with your décor… but, hey, we mean… it IS a bouncy house. You are going to notice it – in a good, good way. Photo booths are a piece of nostalgia that will take your guests back to a simpler time. The photos that your guests snap can also serve as keepsakes and mini-gifts for your friends and family to take home with them on their way out the door. Of course, you and your new Mr. or Mrs. will also want to snag a few keepsakes of your own for the mantle. Sing us a song… you’re the piano man. Music makes the world go round and no wedding is complete without a wedding singer. Lily Road can help to make your wedding unique, providing you with the best wedding bands, ideas on songs for weddings and a soundtrack to build your life on. Whether you want to play something classy… or something unforgettably offbeat… Lily Road makes even this timeless form of entertainment delightfully unexpected. If you want kids, babies may not be too far ahead in the future for the two of you. After all, you do have that honeymoon coming up. Create a special station for your guests to help name your future babies. To make this game a little more fun, house pink and blue cotton candy here too. Hey… naming babies can really make you hungry and nothing says “kids” quite like carnival treats. As you get ready to celebrate your unique coupledom, finding ways to make your special day unique to your story is one way to make the day all your own. From all of us at Lily Road, we wish you a very happy and stress-free planning period. It may not feel like it now, but you’re gonna miss this.